I wasn't going to do a recap post...but I got bored on New Years Eve and decided to make collages with some of my outfits from each month. And just for fun a few photos from before I started the blog, my style has changed so much in the 9 months since I've started blogging, it's amazing! 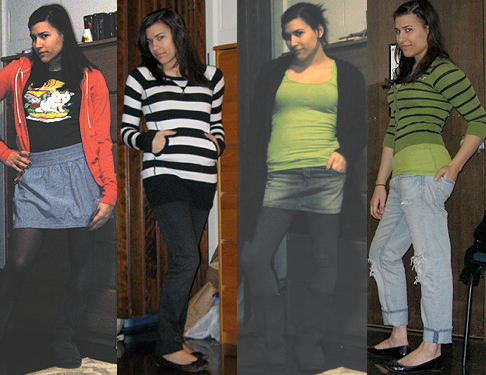 So...here we go, have fun laughing at some of my bad outfits. I find it so funny how my style has evolved over just a few short months... You can make the collages bigger by clicking on them. 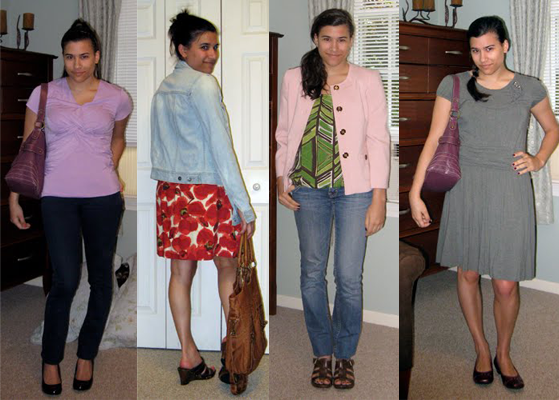 BEFORE THE BLOG (JAN-APRIL): Before the blog I really was a Closet Fashionista, I loved fashion but didn't show it in what I wore. I lived in jeans, hoodies and flip flops. 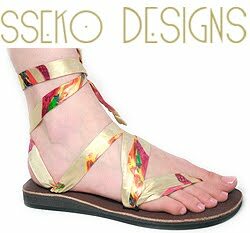 It's very funny looking back on these because the only one I would consider wearing now is the second one, ha ha. SEPTEMBER 2010: Look at this! We're getting even better, still some not really awesome outfits but there are some pretty darn good ones, if I do say so myself. October was a great month! Thank you! I can see you had a very fashionable 2010! Isn't it interesting to go back and see common themes? When I look back at some of my old photos I CRINGE! It is so cool seeing your style evolve! You never looked bad, just so you know!! I think September and November have my favorites looks. definitely improving.. looking better everytime.. love the october looks!! I love how you've traced the evolution of your style - the change is really neat to see. It's lovely to see how your style has changed and how you're now happier with the outfits you're putting together. I love the second look in September, but they're all great looks from that month! I'm so impressed with all of you that have put year recaps together! It's been a wonderful year of outfits! nice outfits!! !best wishes for a great year! You look gorgeous in everything hunnie....what a fab year you had!! Whoa, that's a massive change! The fall/winter outfits are so cute! Great outfits. Your style evolved a lot. I love seeing the transformation, so cool! October and November are my dear favorites. I hope you never have to endure a cringe-worthy month of outfits again! Here is to a fashionable 2011! This is such a cool idea for a post! It's always interesting to see how your style has improved and developed over time...personally, I think fashion blogging in the past has definitely helped me grow my own sense of style - it used to be pretty horrible! I especially love your outfits from September and November. love to see your looks laid out like that!!! awesome!!! Ooohhh!!! I LOVE your collages, you did awesome girlll!!!! Clearly I need to go shopping because woman, you have way more clothes than I do. Beautiful greay October dress. Haha, you have changed a lot! I love that you wear lots of dresses now, and have so many designer goodies from ebay! ; D Looking forward to January! The idea of this post is phenomenal! I can tell that you have your style going on but at the same time try to branch out and put on different things. Purple definitely seems to be the prevalent colour of 2010 :] Happy new year and keep the awesome posts coming! 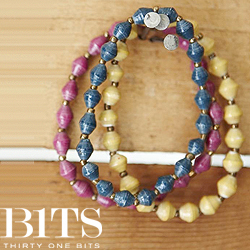 Great idea seeing your style grow! I feel the same way. Since I started my blog, I love my outfits more and more! Great post! I'm new to your blog, but it's neat to see your transition here. so interesting to see how your style has evolved. love this post! 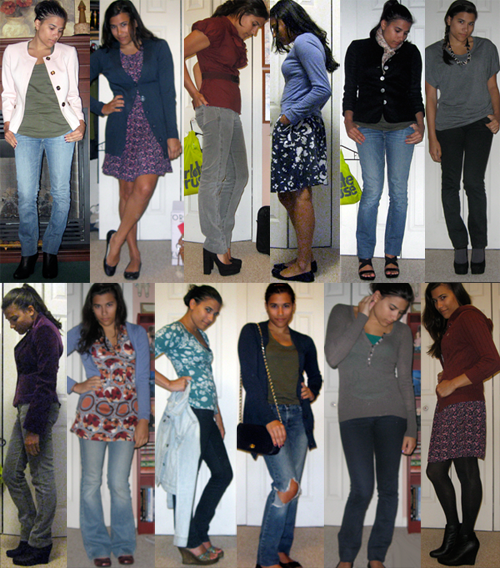 favourite outfit collages are oct & nov. 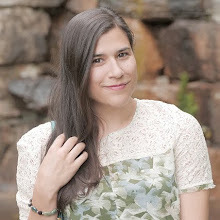 I love seeing how your style has grown over the life of you blog! Isn't it amazing how much more stylish we can become with a little practice :-) I know that I've gotten much more so since starting my blog. Thanks so much for the round up for us.